OpCode Caches are a performance enhancing extension for PHP. They do this by injecting themselves into the execution life-cycle of PHP and caching the results of the compilation phase for later reuse. It is not uncommon to see a 3x performance increase just by enabling an OpCode cache. Given that OpCode Caches have almost no side-effects beyond extra memory usage (to store the cache), they should always be used in production environments. The main side-effect to be concerned about is that there is some overhead caused by the initial caching — this, along with loss of the cache (new server, restarting Apache/php-fpm, restarting the machine) can lead to what is known as a cache stampede — however this can be mitigated by priming the cache. Throughout PHPs life time there have been a number of OpCode caches; one of the first was from Zend (which has had several names), however it was proprietary. Therefore, for the last few years the primary cache being used has been APC — Alternative PHP Cache. While APC is great, it lacks some features found in Zend’s offering, and additionally lacked maintainers to bring it up to speed for the latest PHP versions. With PHP 5.5, Zend open sourced their cache offering, under the new name of Zend OpCache, and contributed it to the PHP project — it is now included with PHP itself, in addition to being available for older PHP versions going all the way back to PHP 5.2! Zend OpCache appears to be more performant than APC, more fully featured, and more reliable. However, Zend OpCache does not contain the secondary feature offered by apc, a userland shared memory cache — to mitigate this issue, a new extension “apcu” has been released, which provides just the userland caching, and is 100% compatible with the original APC implementation. With many people not yet using PHP 5.5, or willing to move away from what they know, APC is still seeing wide use (and is enabled on Engine Yard Cloud by default even), and is still a great option for an OpCode Cache. Moving forward (5.5+), Zend OpCache is the recommended option; there are known issues with APC and PHP 5.5. This document covers both Zend OpCache and APC. After installing any of the following extensions, you will need to restart PHP, either by restarting your Apache or php-fpm. Additionally, you will want to install the Engine Yard PHP Performance Tools. For PHP 5.5 and above, Zend OpCache is compiled as a shared extension by default unless you specify --disable-all when configuring. To explicitly enable it, you must specify --enable-opcache. For PHP 5.4 or earlier (>= 5.2), you can install Zend OpCache using PECL. It will simply add the new configuration lines to the top of the indicated file (if any). You may want to move them to a more appropriate location. Once you have the extension compiled (either alongside PHP, or via PECL), you must then enable it. To do so, you will need to add the following to your PHP INI file. Note: If you don’t know your full path, your php.ini should have the path specified as the extension_dir directive. Alternatively, if you installed via PECL, it would have output a line (very near the end of it’s output) that looks like the following: Installing '/usr/local/php5/lib/php/extensions/no-debug-non-zts-20100525/opcache.so'. If want to take advantage of APC’s user cache, you will also want to install APCu. APCu is available via PECL. APCu provides a full backwards compatible API to the shared memory userland cache provided by APC.APCu should not be installed alongside APC. The install will then ask two questions, you can accept the defaults for both of them. With this in your configuration, you can now use the “apc_*” userland cache functions. This install will again ask you several questions, you can accept the default for each of these. This will install the latest version of the Engine Yard PHP Performance Tools. Both Zend OpCache and APC are transparent in their operation — when a PHP file is executed, the opcodes are cached for later re-use. However, as we mentioned, it’s possible to end up in a situation called a cache stampede. This occurs any time you have high load and your cache is not available — because it has yet to be built, or has been cleared for some reason. To help solve this issue, you can pre-populate your cache, this is known as priming the cache. Unfortunately, at this time there isn’t a great way to prime the Zend OpCache. While APC provides some methods to do this, Zend OpCache does not — however this has recently been added to Zend OpCache and will be available in the next PECL release (and included with PHP 5.6). Send multiple web requests to the server, causing Zend OpCache to cache any PHP used to generate it. Use multiple document roots to retain as much cache as possible when deploying code updates. One way to accomplish our first option, is to use our integration testing test suite (or a subset thereof) if we have one. Otherwise, we can write a simple spider to make those requests. One more thing we can do to improve this process (assuming you follow PSR-0 or similar standards) is to write a script that will include all of your classes in one script — caching a large majority of your application. We have provided a simple HTTP Cache Primer in our Engine Yard PHP Performance Tools Repository, which can be found here. This simple script uses the pecl_http extension to perform multiple requests in parallel; in testing, it can perform over 100 requests in about 4 seconds on a MacBook Air. Note: If you do not have pecl_http, the script will simply make the requests serially, which is obviously much slower. Note: An additional benefit of caching in this way is that it will also prime any HTTP caches, such as Varnish, or Squid. With the addition of opcode_compile_file() in the next release of Zend OpCache, you will soon be able to prime the cache identically to APC below — just use zend-primer instead of apc-primer. Alternatively, you can use opcache-primer which will prime whichever cache is currently enabled. While you can use the HTTP Cache Primer as with Zend OpCache, APC provides us with a way to directly cache any file we wish — while we still have to make a request to the web server, we can make one single request that will cache the entire code base. We can do this using the APC provided apc_compile_file() function, which will compile the given file and add it to the cache. This means we can compile any valid PHP file, classes, templates, etc. Similarly to the HTTP Cache Primer, we have to create a config.php based on config.php-dist, only this time it contains a list of directories in which to compile files, as well as (optional) configuration for HTTP Basic authentication. Note: Basic HTTP authentication provides a minimal amount of protection for this script — a better option is to disable this authentication and include the script within your systems administrative interface. Once you have created this file, you can then either create a simple wrapper that includes the apc-primer.php script, or you can integrate it into any other administrative interface you already have. When you request this file, after authenticating, it will recursively iterate through the contents of the configured directories, find all files with a .php and .phtml extension; then filter out those that reside in tests directories and then add them to the cache. At a little less than half the time it took for our HTTP Cache Primer it’s important to understand that we were able to cache all PHP code in our application, not just what is immediately accessible via HTTP. This is a much more completely primed cached. Additionally, this only took one HTTP request, leaving more resources for actual clients to use. However, on the negative side we did not additionally prime our Varnish or other HTTP cache alongside our opcode cache. Regardless of which OpCache you use, the way they work is pretty much the same. They inject themselves into the execution life-cycle and when possible short-circuit much of the repetitive work. 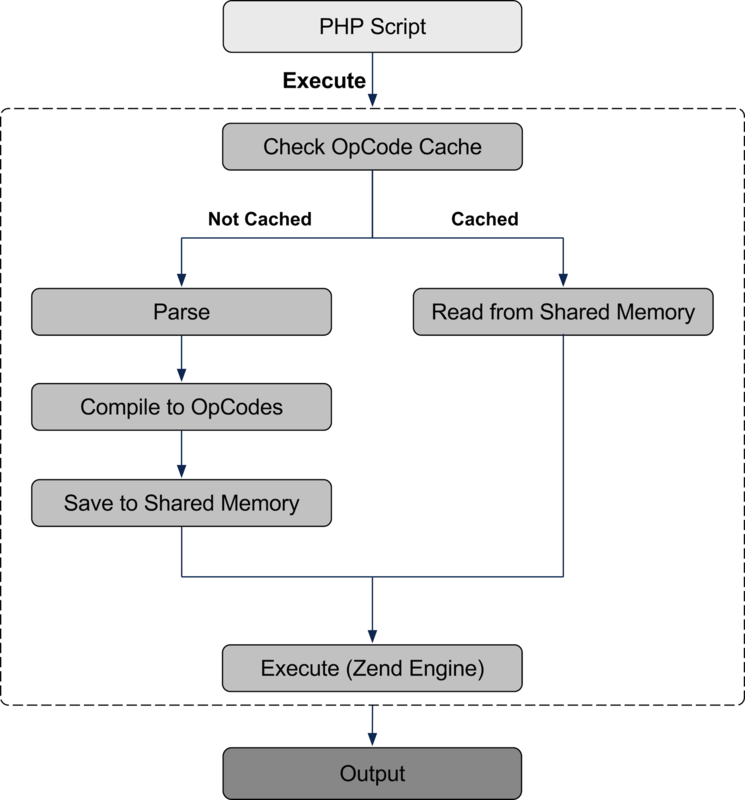 Zend OpCache will additionally perform a number of optimizations when creating the cache. PHP is a scripting language, which most people take to mean that it is not compiled. While this is true in the traditional sense in that we are not calling a gcc or javac; instead we are compiling every time the script is requested. 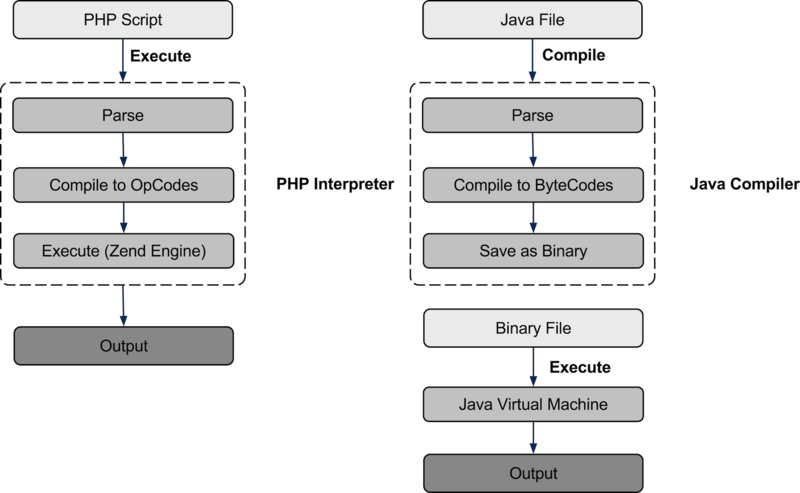 In fact, the PHP and Java compilation life cycles are pretty similar, because they both compile to an intermediary instruction set (opcodes, or bytecodes) which are then run in a virtual machine (Zend VM or JVM). The parsing and compilation phases is slow. When we add an opcache, we short-circuit this process by storing the result of the parsing and compilation phases, leaving just the execution to run dynamically as always. In effect, we are closer to the Java life-cycle now; with the main differences being that we saved to shared memory instead of a file, and can automatically re-compile if changes occur to the script. Once PHP gets ahold of your code, it creates two representations of your code. The first is tokens; this is a way to break down your code into consumable chunks for the engine to compile into it’s second representation, opcodes. The opcodes are the actual instructions for the Zend VM to execute. Taking a simple code example, a vastly over-engineered hello world example, lets look at both tokens, and opcodes. The first part of the compilation process parses the code into tokens. These are passed to the compiler to create OpCodes. As you can see, most discrete piece of the code is given a name, starting with and then a descriptive name. This is where the infamous error comes from: it represents the double colon. Some tokens do not have a T_ name, this is because they are a single character — it would obviously wasteful to then assign them a much larger name — or don’t make much sense. You can see the script that was used to generate this list of tokens here. Next, lets look at how this looks like once we have compiled to opcodes. This is what the OpCode caches store. VLD dumps global code (main script), global functions, and then class functions. However we’re going to look at our class functions first so as follow the same flow as the code itself. A VLD dump is typically multiple dumps, one for the main script, then one for each global function and class function. Each dump is identical in structure. First is the header which lists (if applicable) the class, and the function; then it lists the filename. Next it lists the function name (again, and only if applicable). This is particularly important to take notice of. Note: Not all columns are applicable to all opcodes. There are multiple types of variables within the Zend Engine. All variables use numeric identifiers. Variables prefixed with a dollar ($) are another type of temporary variables (s) which are tied to userland variables like CVs and therefore require things like refcounting. Reading this, we see that we’re in the function of the class , and that we have one compiled variable, , which is identified by . Here we see one compiled variable, , identified by . So lets walk through this, again we’ll ignore the no-op. : The script ends successfully, with an implicit return of 1. While there is a temptation to use this information to start doing micro-optimizations: don’t. Use the opcode cache. It will give you more performance boost than any micro-optimizations possibly can. Additionally, when using Zend OpCache, a lot of optimizations are done for you (e.g. switching $i++ to ++$i when the return value isn’t used). Using an opcode cache should not be optional anymore, it will enable you to get more performance from your hardware with very little effort. If you’re not using one yet, why not?